The Irish Capuchin community is to hold a major conference at the end of February to mark the order’s 400 years in Ireland. 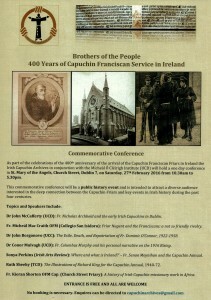 The conference, which is free, will be addressed by a range of speakers on different aspects of the contribution of the Irish Capuchins to the history and culture of Ireland. The talks will look at the central role the friars played in the 1916 Rising, War of Independence and the Celtic Cultural Revival. It will also provide fascinating insights into the life of the friars during the earlier years of the Capuchin presence and mission to Ireland at the height of the penal persecution and our modern day ministries. It takes place on Saturday 27 February from 10:30am – 5:30pm in Church Street Friary in Dublin. Friar Nugent and the Franciscans: a not so friendly rivalry. Fr Nicholas Archbold OSFC and the early Irish Capuchins in Dublin. Fr Columbus Murphy OSFC and his personal narrative on the 1916 Rising. Where and what is Ireland?’ – Fr Senan Moynihan OFM Cap and the Capuchin Annual, (1930-54). The Illustrations by Richard King for ‘The Capuchin Annual’. A history of Irish Capuchin missionary endeavours in Africa. 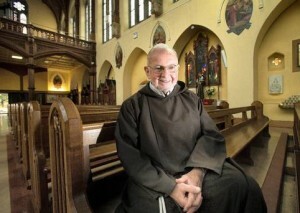 The Irish Capuchin Franciscans are linked back to St Francis of Assisi who, in 1209, having heard the call of Christ from the Cross to “Go and Rebuild my Church”, dedicated himself and his first followers to the living of the Gospel of Jesus Christ in the service of the Church through a life of brotherhood, prayer and sharing the Good News with all creation. The Capuchins came to Ireland in the early 1600s and since then they have been known as friars who supported the Irish people in some of the most difficult times in history. Through persecution, famine and poverty, the brothers continued to be a comforting and healing presence, and as advocates of religious freedom, cultural expression, and relief of the poor. Currently the Capuchins have nine friaries in Ireland as well as missions in Zambia, South Africa, New Zealand and South Korea. One of the best known faces of the Capuchins in Ireland is Brother Kevin Crowley who opened the Capuchin Day Centre for homeless people over 40 years ago in Bow Street, Dublin. From its very humble beginnings in the Friary garden it now provides over 700 meals each day and over 1,500 food parcels each Wednesday to the homeless and poor of Dublin. In addition to this the Centre provides a medical service (doctor, dentist, chiropodist and nurse), counselling and shower facilities. The Capuchins also run the Friary Food Project in Kilkenny, which opened in 2014. It provides food parcels each Tuesday to the poor and homeless of Kilkenny City. An outreach of the Capuchin Day Centre for Homeless People, the project currently provides up to 200 parcels each week. Involvement of the local community is very important to any Capuchin ministry and the people of Kilkenny have come to help pack and distribute the parcels.